The interwebs was quick to respond in the negative with a flurry of counter-tweets. “NO! It screws up the demographics and makes it look like there are fewer “Non-religious” than there are!” said Andrew Carter. And “please don’t!” said Terence Eden, offering a link to the BHA’s Census page via http://bit.ly/g41pT8 and his own thoughts on the matter. It didn’t take long for the wisdom to settle. 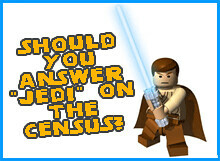 “OK, outraged #humanists/#atheists,” tweeted Cory, “you can stop telling me I’m not a #jedi already”, offering a link to a fresh Boing Boing blog post on the Census and asking “is that penance enough?”. “Just about”, replied the BHA. Looks like Cory is absolved of his sins. Twitter: home of celebrities, cat videos, and recantations of fictional religions by high profile science-fiction writers set upon by virtual angry mobs. I think the fact that an arms manufacturer is dealing with public information is more critical than what people put down as their religion. why is this census run by lockheed martin ? also if you click on download PDF it goes to an uncertified site with WARNING !!!!!! UNCERTIFIED SITE ..
anyone know wtf is going on?? ?